Performance Santa Fe | Performance Santa Fe Havana Cuba All-Stars: ASERE! While some music demands quiet contemplation, the fiery sounds and styles of Cuban cha-chas, rumbas and salsa tunes, demand movement—and lots of it. 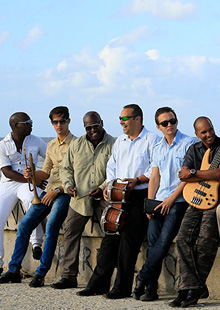 The Havana Cuba All-Stars are an ensemble of some of Cuba’s finest musicians. Their ASERE! (Friendship) program features three of Cuba’s most celebrated dancing couples. This energetic celebration of Cuban culture promises an evening of irrepressible, enveloping sound and movement. Quiet contemplation is neither required nor recommended. Underwritten by Robin Black; Ann Murphy Daily & William W. Daily; Thornburg Investment Management and Heritage Hotels and Resorts, Inc.